Public it may be. A convenience, assuredly not. A closet on water, most certainly. A water closet, unlikely. 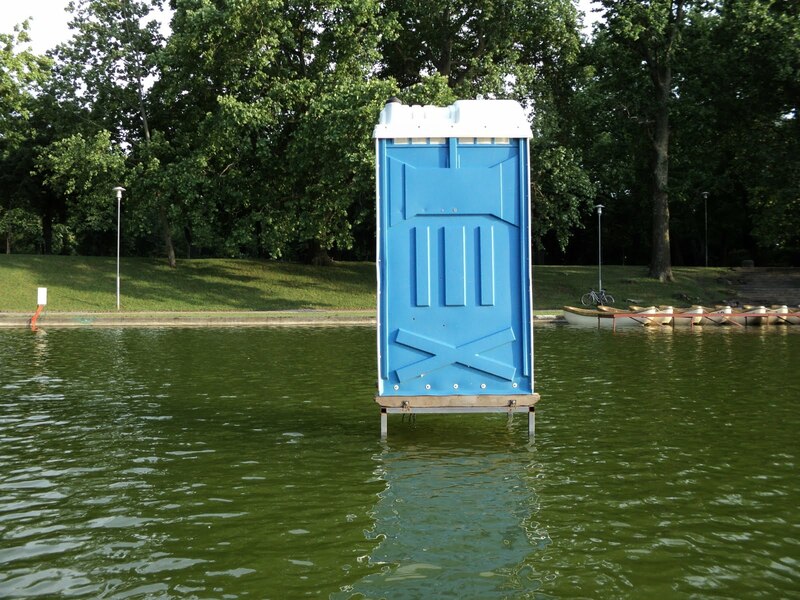 For this 'Portaloo', or mobile lavatory, standing as it does in the middle of the lake of the City Park in Budapest, is but one of some twenty-five works of art which make up the current exhibition 'Múvészet a Tavon', 'Art on the Lake'. And throughout the summer visitors to the park may for a while take to the waters in a hired skiff, dip oars and sail, if not into the sunset, then at least to interact with these several wonderful, and fun, pieces. From Jaume Plensa of Spain comes a sculpted figure, 'Soul XII' [seen above, bottom left], made up of steel letters of the alphabet which, in combining words drawn from several languages, radiates both sensuality and intellectuality. 'Exclamation Mark', the work of Syrian-Hungarian Rosá El Hassan, is a towering design which employs traditional basket weaving techniques enriched and adorned with Roma motifs. Josef Bernhardt through 'Waiting for Birds', a series of bird boxes set on stilts, allows us not only to be in touch with the natural world but, on another level, to consider the work as an expression of freedom, of transcending both physical and political borders. A recipient of the prestigious Munkácsy Award, Hungarian Ilona Németh has contributed 'Floating Gardens, Private Islands' [seen above, top right]. Here two, fully planted and maintained gardens highlight the issues of personal, private space, of security, and at the same time make reference to the more original elements of guerrilla gardening. Discovering the 'Múvészet a Tavon' from boats, from the banks of the lake, or from the bridges which cross the park will, it is to be hoped, enable many thousands of visitors to have an opportunity to confront and react to the exhibits themselves and also, in some way, great or small, to reflect on a world of which they too are a part. And now as the sinking sun threatens to melt the red 'wax' of the 'Karl Marx Column-Fountain', it is time to pull for the shore. Briefly entertaining, but I'm afraid not my idea of art; I am equally unimpressed by Tracy Emin's unmade bed, or some other so-called "installation" art. I'm searching for my flak jacket, as I slope off...! We are pleased that you liked what we showed of the exhibition. We agree that many of the works explore environmental issues and do make one think about the conflict of the natural and the man-made. Perhaps one of the goals of such exhibitions and, indeed, our post, is to spark debate. What is and is not Art will always, in our view, be open to discussion and that is exactly how it should be. Bound to make people talk, which I think means success for public art. Now would it be within the Budapestian's? desire to use the water bound water closet? I can't imagine anywhere in the world where it wouldn't be seen as a challenge by young men. it's not been for long that art's been popping up where it was never once allowed, and that says alot about the emncipation of culture. 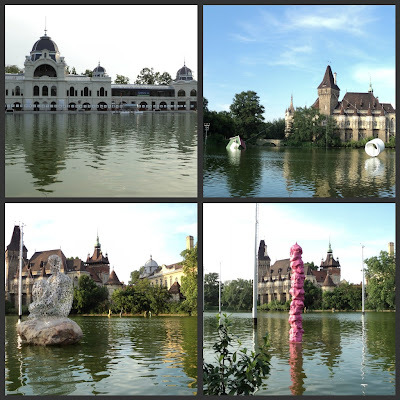 How sensible to use Budapest's City Park lake, no doubt a place of carefree unwinding, as a platform or canvas. I like the sinking dolls' house in particular. Could we describe it as "thought provoking entertainment". Whatever you want to call it I wish I could take a boat out and soak it up. Another wonderful post. Thank you. Of course, we have only highlighted a small selection of the works here, and each is very different both in its concept and execution. Irrereverent, amusing, 'classical', strange.....the adjectives can go on and perhaps one or more or none represent Art for some. Hello - My favourite exhbits are the bird houses, the gardens and the little house/shed. I'm already thinking where to put them in my garden once the exhibition is over. I think I have space for the gardens and perhaps just one or two of the birdhouses would suffice - wouldn't want the neighbours to think I was showing off. The house could simply replace my little shed - I might even move in - after I have moved out of your bathroom! I do like quirky public art. Yes, the exhibition is already proving to be quite a draw, especially as one can enjoy a lakeside view from the comfort of a dolly mixture arrangement of seats on a platform which stretches out over the water. This is a most pertinent point which you raise here. Of course, for many, many years the only Public Art allowed in Hungary was controlled by the government of the day and only selcted artists allowed to exhibit. It is indeed, a sign of the changing times when such a significant public space has been opened to contemporary artists from throughout the EU. Indeed, call it what you will. We can certainly testify that on a warm evening as the sun is setting it makes for the most magical of experiences. The bird houses are indeed amongst our favourites. Although we have the space but not the style, we rather fancy the idea of installing the white Mobius Strip [which incidentally is covered with tiny lights for night-time viewing]in a completely minimalist interior. We might pursue this with our friends who have just the kind of apartment for it!! I rather like the sinking shed. I could tolerate the birds nests and chequered cars. But I'm afraid the rest would never grace any lake of mine. Certainly not the blue plastic thing! What an absolutely fascinating and wonderfully playful art display / installation. I have always loved how such installations must be absorbed as a whole to appreciate the singular. An interesting selection. The bird boxes and the submerged house are certainly favourites of ours. I always love your picks. So creative. Playful is exactly the word! And, although the installations capture one's attention when seen from a distance, they really do come into their own when viewed close up from the rowing boat. Thereby, the boat, its rower and the occupants also become part of the overall scene. Budapest is a city full of surprises and wonderful images. We never tire of it. A water closet on the lake... And the others... How nice art works! Thanks for showing us these, Jane and Lance. Otherwise how would I have a chance to see these art works in Budapest? Far away things come closer by the internet. Portaloo on a lake? That's what I call arty-farty. I love the bird houses! Plenty imagination at play here and good to see. Note to self - try to visit Budapest one day! The art is not exactly my cup of tea, but I would go for the sunset boat ride---sounds enchanting! You are so right, The internet really does bring one into contact with, and to experience, so many very different things which, without it, might well pass one by. And we too are the richer, Sihirli, for having the tiniest insight into Turkish literature. Thank you. Clever, witty and very, very funny. You have made our Sunday!! One day you really must visit Budapest. It is the most romantic and cultured of cities and has many, many interesting galleries and museums, all of which are worth visiting. Yes, what makes this particular exhibition so very good, in our opinion, is the way in which it brings art literally out into the open and is there for everyone to enjoy. What a wonderful exhibition, and all the more so for the watery setting emphasising the essential transience of the pieces. Perhaps the viewer himself or herself, out of their natural land environment on the lake, temporarily becomes part of the show, creating Art in Flux? What we feel is so good about this exhibition is that it evokes different responses with different people, all of which are totally valid. Yes, to row on the lake is magical. And this is the first time as for the last ten years it has been drained and waiting to be renovated. We understand that the cost has largely been met by EU funding. This is such a perceptive comment and one which, in all likelihood, reaches to the very core and purpose of the exhibition when viwed as a whole. Yes, of course, each artist through his or her work is making a particular statement but in so doing is contributing to a whole which is, as you suggest, so much greater than the individual parts. Art in Flux most certainly. What a beautiful treat this morning, sipping cappucino and sailing with you in Budapest. The opening picture of the duomo building and its reflection made me want to grab my paint box and capture this scene. What is is building name? Installations and a public forum are a wonderful way to introduce society to art and to not be fearful to view art. Families truly benefit from this type of art as it includes all ages. We always learn and there is inspiration to be gleaned from such works. I love the delicate nature of the wax sculpture and the bird houses are so beautifully presented. Don't you find the reflections of the objects in the water are sometimes more interesting than the subject itself. I will be visiting these images again and thank you for taking us to Budapest on this glorious Sunday morning. Art on The Lake. How clever to mount this exhibition on water, enabling an extended metaphor to these reflective works. Sometimes the works will produce a mirror image. Sometimes ripples will break-up the reflection. Some works appear to rise from the deep while others seem to be sinking into the abyss. I particularly like the pink obelisk and fountain made-up of Marx 's heads. On the other hand, the sinking house is too much like the images we see every day on the news here of houses that have been swept away in the recent floods. The original part of the building which you mention was designed by Lechner, a famous Hungarian architect, in the C19 and has always had the purpose of being a place for changing and observing the ice skating which takes place on the frozen water in the winter months. Indeed, this is the largest outdoor ice skating rink in Europe. The restoration of the lake and the building is now nearing completion after a long period of closure. The music room housed on the first floor, under the cupola, is also part of the restoration. As you say, the exhibition attracts all ages and, as it is open until dark, is constantly changing with the alterations in light and with the added dynamic of the water. Although the whole area is floodlit, some of the works themselves are individually illuminated in a variety of ways. The water itself does indeed add a further dimension to the works, whilst also enabling the viewer to see them at close quarters and from a variety of perspectives. The house is an incredibly powerful image and, as you say, is a terrible reminder of those who have lost so much in floods throughout the world. Of course, this is part of the message, in our view, of this piece. What fun--and inspiring. Your title put me right in the mood--one of my favorite lines from Wind in the Willows: "Believe me, my young friend, there is NOTHING, absolutely nothing, half so much worth doing, as simply messing about in boats." I think Rat and Mole would have enjoyed Art on the Lake. We are sure that you are right! It was and is great fun and how perfectly the quotation from 'Wind in the Willows' sums the experience up! As one approaches the lake across an iron balustraded bridge, the whole scene does have a somewhat 'fantastical' look, which all adds, in our view, to the experience. As so many have all ready stated, I love the way the water and nature becomes part of the art. I'm imagining them at different times of day, in different light, weather. So grateful to you for brining us to the most wonderful places and discoveries! Yes, 'Waiting for Birds'is very dramatic and, at the time of our viewing, no bird had yet made a nest there. The ducks, however, were more than happy with the foundation structure, as can be seen on the photograph. You are so right about the context for this exhibition. The setting on the lake backed by the 'sham castle' which is now an agricultural museum lifted the whole experience. In addition,we were fortunate to be accompanied by our friend who is a trained guide and having some information about the individual artists and how 'Art on the Lake' was conceived again makes a big difference to how one views and appreciates the works. All of the things you mention do, of course, mean that the scene is constantly changing and shifting. One can never see the same thing twice, we feel, however often one might visit. Two things I greatly appreciate: First is that Art - in any form - whether I like it or not, speaks of individual creativity and our right to diversity as free spirits on this earth; the second is the gracious and patient address, Jane and Lance, to each post in response to your own "blog" art! Very classy! What a fun post! Thank you for showing us this. We agree entirely that freedom of artistic expression, long overdue in so many former Eastern Bloc countries,is an enriching influence on our lives. And, we love the many and diverse comments which people take the time to write here since that, for us, adds so much more to our initial ideas and broadens our outlook in so many different ways. Yes, it was great fun, although there were times when the boat wobbled rather alarmingly! Love the art! Wish I could see it in person. Thanks so much for posting. We are so pleased that you have enjoyed the post. Budapest is not really on the route to Spain, but perhaps, one year...!! I love to see public art installations. It gets everyone into a conversation from children to adults. It's hard to even say which is my favorite here, they are all so different both in visual and in meaning. While these are not to my liking I do appreciate that we all have different tastes! I wonder if artists create these pieces just for the shock value. 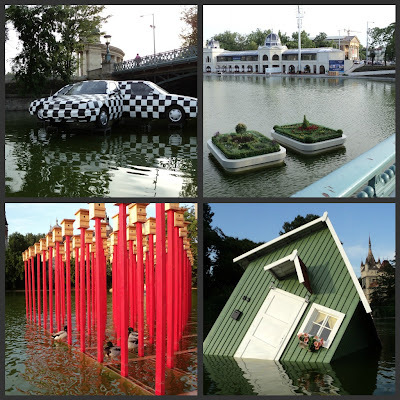 The renting of the boats is a great idea and brings you to art with a whole new perspective. Yes, the point you raise here is so important, in our view. Public art, by its very context generates comment between all who encounter it and so it crosses age and gender divides. The pieces are all very different and each time one looks one has a different favourite. Several of the works do indeed have a shock value and, for some, that was a deliberate intention. As the whole exhibition, in general terms, is about the conflict of Man and Nature it is perhaps inevitable that there will be much to alarm as there are so many instances in our world which are so very shocking. Stunned. I feel like my imagination and concept of the world has just stretched after reading this post and viewing the images. My immediate ancestry is Syrian, but a bit further back, we hail from Bulgaria. Reading and viewing something like this makes me feel so underexposed. I thrill to take these journeys in the way in which I am currently permitted-- through the eyes of other bloggers, not the least of whom are my fairy godparents. We are so pleased that you liked the images of the exhibition. In general, we are great supporters of Public Art too. Last summer, 'elephants' in many different guises roamed the streets to raise the issue of the homeless and the summer before there were herds of cows. What quite they were in aid of we cannot now recall but they were huge fun. How amazing that your sister was engaged in Budapest. Lovely! I love the sinking house. Very Pacific Northwest.With all the rain we have had this year, there are some real examples dotted along the coast near Seattle. Lovely post as usual. It's nice to have some class out there. Yes, we thought that the idea of rowing a boat to view the art works was a brilliant idea. And, being Hungary, no life jackets or other health and safety regulations to get in the way! What an intriguing past you have and, of course, all the myriad of influences which will have been brought to bear on your upbringing. We are delighted that you have enjoyed looking at 'Art on the Lake' through our eyes at least. It is, for us,one of the absolute treats of being based in Central Europe that one has easy access to so many differing cultural activities. And, please tell, do we have to DO anything as fairy godparents....like wave a magic wand now and then? We are very conscious of the terrible flooding that has occurred in so many parts of the world and, for us too, the sinking house has a strong resonance with this. And, thank you so much for your very kind and generous words. They mean a lot to us. Hungarians appear to have a great sense of humour. I admit that your last post showed a rather different side; but as one might say: democracies all operate differently from each other, totalitarian regimes are the same the world over. Strange that you should say this as in a poll we read somewhere, Hungarians were amongst the most depressed people in the world!!! In this instance, however, certainly there is a lightness of heart which is commendable and perfect to enjoy in the lazy, hazy days of summer. You are absolutely right, Dee, and when you see them close too in the boat they are, as you say, amazing. The sinking hut is indeed great fun but our favourite is still the one of the bird boxes. Which says it all. And let's keep it coming! What a fun exhibition this is. For such an old town, Budapest does have some very modern art! It must be a joy to walk through Budapest and see what's in the water! I like the birdhouses on the poles and the lopsided house in the water. I forgot to mention that I enjoyed your comment on my blog about the fact that you start to enjoy cottage gardens as much as formal gardens. I think you can't really compare these gardens, as they are so different. They both have their own charm. I love Sissinghurst, for it's beautiful 'one colour' gardens, the abundance of roses and from a historic point of view. However, I loved Great Dixter too, with it's fields of wild flowers, colourful borders and the romance of the place. Budapest is a vibrant and confident mix of the old with the new in terms of Architecture, Art and Music and all manner of other things. What we always find most heart warming is the way in which concert halls, galleries and theatres are filled with people of all ages which is so very different from England. You are so right that it is difficult and, perhaps, unnecessary to compare gardens against each other since there is, so very often, something to be drawn from each. We love the way that you do this in your own garden. Areas more structured together with areas which are more free flowing. A new and delightful experience around every corner. How truly fun it would be to float about in a boat and 'soak' in all the artist creations. My favorite has to be the house. To make it float like that without sinking would not be an easy feat. All are remarkable, even the floating loo! I hope you two have had a glorious weekend? I very much admire cities who take their art displays seriously enough to have fun with them. You clearly picked a progressive and welcoming city in which to live. Yes, it was fun and it was so good to be able to get up really close to each of the pieces and investigate them thoroughly. Fortunately, our friend, Laci, who rowed was an expert with the oars! We hope that you too have had a lovely weekend. Such a good point. The exhibition has been some three years in the organisation and planning and so quite a feat to pull so many different artists from so many differnt countries together at one time. This was certainly an interesting post, and you did indeed spark some debate regarding art. I suppose art, like beauty, is in the eye of the beholder. These make the water and landscape a conversation piece. I have posted an edited version of my story even as Blogger has given me fits this morning and I'm slowly developing it. Feel free to read if interested. You are so right that such displays of Public Art really do ignite debate, at times, quite heated. What is important, as we see it and perhaps you do too,is that at least there is conversation which shows some kind of resonance for positive or negative with the human spirit. Life is made of such experiences, we feel. And, is it not so good that we all like different things? What a tedious world it would be if we should all agree about everything!! We do so hope that you have enjoyed your short break and are suitably recharged. We think of you both often. I always keep a very open mind when viewing art in all forms. And I have to say, this does appeal to me. The idea that you can set sail on the lake to have a closer look at the different works must be great fun. The 'Portaloo' did make me smile... no queue to be found outside here! A few years ago, one of the National Trust properties in Northumberland commissioned artists to create temporary works within the estate. A four poster bed and smaller single bed were set afloat on the estate lake. The idea was to present an interior object in a state of vulnerability within the outside world. I find it wonderful that I can view art within the City Park in Budapest, without having to leave my own home! Thank you both for another interesting post. And also for your usual kind comments on my own post, it is always lovely to read them. We loved it, the evening was perfect and although not every work of art appealed it certainly got us all talking about it. The beds on the lake sound to have been a most imaginative idea. We rather like the concept of art in the landscape since it usually brings an added dynamic both to the art work itself and the surroundings in which it is placed. As you say, it is wonderful to be able to experience the world from the comfort of home. We hope that you have a lovely week. We have a pontoon boat and I can think of nothing more fun that boating from one work of art to another to ponder and amuse! The loo, on the other hand, could really come in handy sometimes!! Fun post!! Isn't that something interesting? I love the ideas shown here! (The house especially) Really cool stuff here! :) Thanks for sharing these, it does make art interesting if it is set in unexpected places. Lewandowski is one of my all-time favourite names in 19th century music. Do you think it might be the same family? Art like beauty is in the eye of the beholder. While I found the 'Portaloo' extremely funny...it doesn't strike me as art. And while the sinking house was somewhat interesting, I saw the wind in Arizona accomplish the same thing one summer when it blew my storage shed over the block wall and into my neighbors swimming pool. Another great post and one sure to stir up interesting comments. Thanks for such wonderful posts! I like this kind of art. I find quite funny. We are so pleased that you enjoyed highlights of the 'exhibition'. As you say, it is quite extraordinary that so much can be shared so quickly around the world thanks to the internet. Your pontoon boat sounds to be great fun. There is something very pleasing about getting around by boat - a great change from the car. The 'loo' has certainly given rise to some comment and has sparked some lively debate. 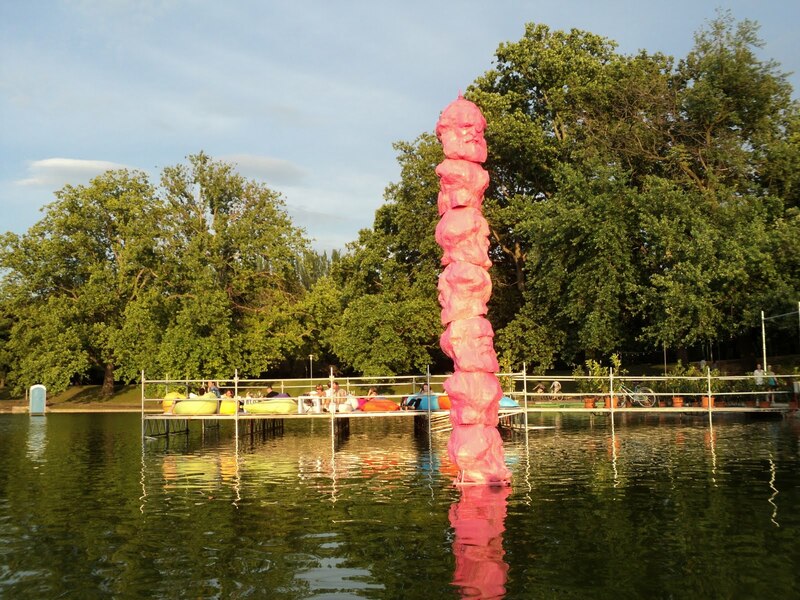 Yes, we would agree that the whole idea behind Art on the Lake is exceedingly innovative and, as you say, through the unusual setting, one views the works in an entirely different way. It really does seem something of a coincidence and the two might well be related. Artistic talent, in its widest sense, does very often run in families moving from one generation to the next and to the next. We are not certain how common the name Lewandowsky is. That so many have experienced storms and flooding in recent times in so many parts of the world, and particularly for you in Arizona, may well be the point which the artist is considering - the impact of natural disasters on the environment and their connection with the ways of man. Whatever, it is good that exhibitions such as this one produce lively and good hearted debate. As always, your comment, Michele, is very much appreciated. We are delighted that you have enjoyed the 'exhibition'. We found it great fun too and it has given us a great deal to think about, particularly the artists' intentions with their individual works. We hope that you have an enjoyable week too. We shall give it a try but do not hold your breath waiting for a result!! We are so pleased that you like the park - a green oasis at the heart of the City. The 'sinking' shed is great fun, we agree. A relef to know that the ginger candies did not finish you all off!!! What a spectacular idea! Regardless of whether one likes art objects or not, I think these projects are very lively, and they attract visitors, and maybe even unite them. I wish it happened in High Park. Oh, Olga, we do so agree with what you say here. Of course some people will like thm, others will hate them, but they do at least evoke a reaction and put art into an open forum. And, possibly, they serve to heighten an awareness of contemporary art amongst people who may never, for whatever reason, visit a gallery. Call me uptight but I find the loo on the water a bit questionable as "art". Lacks creativity IMO. Now, the Karl Marx column-fountain definitely takes a creative imagination. Some symbolism going on there with the phallic shape perhaps? Overall the exhibit looks like fun and certain to get some conversations going. No, the 'loo' would not be our favourite but it did look rather fun isloated in the water of the lake. But, as you say, the exhibition has created much debate since it opened and has, in our view, raised awareness of contemporary art among people who would not necessarily go to a gallery. And it is great fun rowing up to the exhibits in boats which have been specially designed for the occasion. I like exhibitions which are a bit 'different'! A great concept, well executed. We are pleased that you like it.The whole way in which the exhibition has been staged has definitely reached out to groups who might not usually go to art galleries. And this, we feel, is one of its greatest strengths. Rowing a boat to see the exhibits is, of course, great fun and makes the whole experience interactive. Oh my God! Something similar happens here during the "Biennale d'arte". I won't give my opinion on such art installations. In recent years there does seem to have been a trend for 'installations' as an expression of Public Art. Obviously, this is the case too at the Venice Biennale d' Arte. Thank you for this great review of art, yes art, in Budapest. 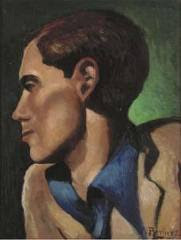 Having a Londoncentric view of contemporary art, it is good to see what is going on further afield. The idea of boating around these works is delightful. 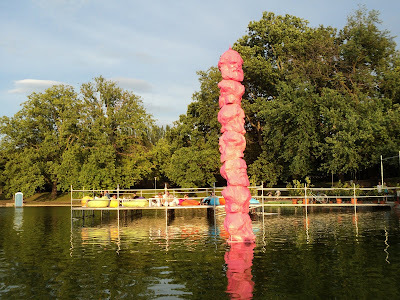 Love the idea of the sun slowly melting the pink marxist totem pole! The floating gardens resonate with lots of contrary meanings. Wunderbar! Your comment is much appreciated and we are so pleased that you have enjoyed a glimpse of 'Art on the Lake'. The innovative way of displaying these works is a great step forward for Hungary where such exhibitions are normally contained within traditional galleries. Not only has this made contemporary art accessible to large numbers of visitors, viewing it by boat has also provided an element of fun. Well how do you do, Jane and Lance. Delighted to make your acquaintance, via the ever delightful Heather and thank you for introducing yourselves on my blog. I have one foot out the door (being 8 am Tuesday in Melbourne) but can see I will be running late this morning as I am having too wonderful a time perusing your deliciously drily witted blog. As for these artwork installations, they are of the best art in my opinion, because they come with humour. Now I will never write "WC" on my bathroom floor plans in the same way again, without thinking of this charming literal application in the water. Thanks so much for stopping by! This is so interesting, thats what I love about art, how subjective it is, what is beauty to one is atrocious to another and so on. I appreciate these expressions and am particularly fascinated by the sinking house and the floating water closet! Thats a riot! Thanks very much for sharing these photos! It reminds me of a similar art display in the moat around Örebro Castle in Sweden that I saw a few years ago. The idea of putting art show on water is inspired, as it takes art out its usual indoor setting and puts it in the natural world. The water closet definitely has me! How clever! We are delighted to welcome you, Virginia, and thank you for not only your kind comment but also for becoming a Follower. As for the installations, we are so pleased that you hve enjoyed this vignette of the exhibition and that you have appreciated the humour which is to be found in so many of the works. We do agree with you that WC now takes on a new meaning! You are so right, Tina, when you say that 'art' is so very subjective which, of course, is in part its interest and which, as here, leads to widely differing opinions and some lively debate. Your comment is much appreciated, thank you. The exhibition which you saw in Sweden some years ago sounds most interesting and something which we should have much enjoyed seeing. It is wonderful today, as you say, how so much contemporary art is to be enjoyed outside of the walls of museum or gallery. Then of course it will happen! Now, where did we put our wand?! You are so right for it is the originality of the ideas behind this exhibition which makes it of so much interest. In total sixteen artists are represented, each from a different country within the European Union. Yes, we agree that the way in which the pieces are presented shows great creativity. Even more remarkable as the curators responsible for this exhibition work with the Fine Arts Museum where, generally, works are hung not terribly imaginatively. jane and lance....thank you for sharing this lovely exhibit with us. summer always brings new and wonderful outdoor exhibits to interact with. the perspective is so much different when viewed under the sky rather than within walls. You are so right. Everything takes on a new look in the great outdoors as the light changes and day becomes night. In addition, the water adds another dimension, its stillness, its ripples and its waves all adding to the visual impact. Ephemeral indeed since, come the winter months, the lake transforms into Europe's largest outdoor ice skating rink. But, effective in the meantime! Thank you for sharing these fascinating pieces! I love the little up-ended house complete with window box! Modern art always sparks debate. I recall a trip to the Tate Modern, I was so overwhelmed with trying to find meaning and purpose to the installations that I gave myself a migraine!! I must say what I'm glimpsing of old Budapest confirms to me that I prefer age and history and, I suppose tradition... call me old-fashioned if you will ....! Thank you so much for your lovely comment at mine. Illuminating and eclectic blogs like yours are what pulls me back into blogland every time. I look forward to more of your Budapest musings. PS I'm loving your bathroom, and coveting those fluffy white towels. More 'style' posts please!! You are so right in that people vary so much when it comes to their responses to contemporary art. Perhaps that is its strength - the capacity to ignite debate! At every turn in Budapest there is evidence of a grand past together with a modern future. What we find inspiring is the confidence with which both seem to co-exist. Thank you so much for your kind and generous words about our venture into the world of 'style' blogs. We find so much to inspire and interest in what you write that each visit is a joy! Very interesting and fun works here...love Soul XII, and the bird houses are a sweet idea. I wonder if the birds are using them. The irony of the WC is very understood, but as I am so appalled by them after having one in front of our house for four years, I have a very difficult time associating them with art...no matter how ironic (I'm sure our neighbors feel the same way too!). I do love the creativity of it all though...what fun it must be to visit! Thank you so much for sharing!! Jessica, we are so pleased that you have engaged with the exhibition with such interest and enthusiasm. Had we known of the situation with you and 'Portaloos', then we should, of course, have chosen another image!!! We too love the bird boxes best of all; to date they have not, rather sadly, been occupied by any birds. If that were to happen, then it would add a further dimension. The exhibition looks great, and if I were within striding distance I would definitely enjoy spending hours in it. But what captivated me most were you opening lines describing the inconveniently placed carsie. We are so pleased that you have enjoyed this glimpse of the exhibition which we really think you would find fascinating - with or without the 'Portaloo'! Approaching the works by boat is great fun and definitely different. great that you spend the time to leave a comment. wow.....truely fabulous images, would love to see them for real!!! This is one of the reasons I (sometimes) miss city life! Whether one likes it, or not, the eye and brain are continually challenged by art that is fresh and controversial. Personally, I can't imagine anything more delightful than boating and debating amongst and about this whimsical display. I wish I could see that in person. Most interesting. The exhibition really is rather special, not least for its setting in the park on water!! We very much enjoy keeping up with your blog, Cynthia, and thank you too for the comment now. Actually to see the exhibits close to, rather than as pictures taken with our very basic camera, is quite something. But we do hope that we have given you something of an idea of what the exhibition is like. We enjoyed a life in the country for over twenty-five years and so, to live in a city is, for us, a relatively new experience. But we do so agree with what you say about this art, and indeed all art, providing a constant challenge to the eye and the brain. Playfulness of mind! What a wonderful expression and one which is so apt for this exhibition. Thank you for the pointer to Aaron Elkin's book, 'Loot'. We have noted this and will, when we are next back in the UK, seek it out. It sounds fascinating. Yes, the exhibition, whatever one thinks, is well worth a visit although to travel from Canada might be a little much! Thank you so much for 'visiting' and for leaving a comment, both of which are much appreciated. The water closet on water made me giggle... but might not if I were in desperate need of one. Very interesting pieces of art!! Beautiful modern artworks, those are not really my style. But,those has something to say too about situations of nature.. my favorit one is the drowning house. Yes, we do so agree about the Porta-Loo! We are pleased that you found the works of interest. Altogether, and viewed from a rowing boat, the exhibition we found to be thought provoking and fun. The best thing about Public Art is that one can probably count on as many different reactions as there are viewers! With flooding issues so widespread in the world, the submerged house was both uncomfortable and timely. We thought it to be one of the best too. How wonderful! My town put art in the middle of all the traffic circles, which I love. What a brilliant idea. You must have a very forward looking town council! Does it, we wonder, encourage people to drive around and around to see all the works? Art challenges the way we view the world. Good art may get us to re-examine the way that we interpret the world. Excellent art makes us change in such a way that we view the world differently ever after. Much of the new or the temporarily popular art is at best a diversion, an amusement, a forgettable flibbertigibbet of a thing. At worse it is a tiresome brashness that wants to shock but instead may bore. What many modern artists lack in talent unfortunately make for in audacious presumptuousness. Oh dear, I sound like an old fuddy-duddy. I do like "Waiting for the Birds", but at the portaloo I draw the line! This is such an insightful comment and one with which we are in complete agreement. 'Art on the Lake' is, to a very large extent, a 'diversion', as you put it, but in its ability to amuse does, we feel, attempt to raise awareness of some of the many environmental issues which currently affect our world. Like you, 'Waiting for the Birds' would possibly be our favourite piece. Your comment is much appreciated and adds considerably to the debate. Yes, the whole thing is great fun and the setting makes a huge difference in that respect. What a wonderful idea to use melted down Lenins for an art work. Perhaps there is a market out there somewhere for Lenin inspired home furnishings, reestablish the Cold War right there in the drawing room! Thank you for the link, we shall be sure to look it up! How interesting to see the metal Jaume Plensa sculptures! They seem to be everywhere this summer: The Yorkshire Sculpture Garden, and even lining the banks of Buffalo Bayou here in Houston, where they are called "Tolerance" and as always are constructed of words. Saludos! This particular sculpture is so very impressive when seen at close quarters. We loved the way in which so many different characters from so many languages were used to make the human form. And yes, we were aware that others had been made in this series and knew of one in Prague but had no idea that they had reached the UK and USA. Marvellous! Yes, it is a lovely idea and it is a very pleasant way to spend an afternoon or an evening. Really great. Would love to see it in all its glory! It is in fact huge fun and has been very popular with visitors. An ideal exhibition for the summer months when to be out on the lake is slightly cooler! Public art like this is to be applauded. And the setting and backdrop to the pieces, perfect. I love water myself, and the thought of boating around a "art gallery" on a lake is very desirable. When I see art in public spaces such as this, I love the way it makes people, who may never visit galleries or consider themselves as art-loving, see and think about the pieces, and form their own ideas and interpreations whether they be positive or negative. What is very interesting for me (this being months after you posted) are the variety of reactions (some very strong!) the exhibition has raised in your readers. The fact that public art can bring out such differing reactions and, as you say, can 'involve' people with art who would not otherwise think to enter a gallery, makes it for us entirely worthwhile. In the case of this particular exhibition, being able to view it on a balmy summer evening whilst rowing around in a boat made it simply magical! !